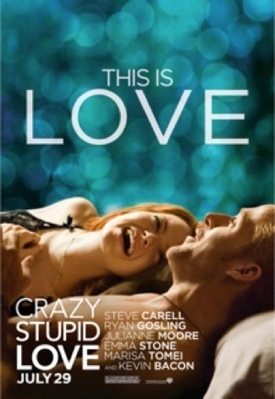 Love is front and center in this crazy romantic comedy film that’s also stupid− really stupid at times. Cal Weaver (Steve Carell) stars alongside Julianne Moore as his wife Emily, and their two children, Robbie, 13, (Jonah Bobo) and Molly, 8, (Joey King). This suburban family is thrown a major curve ball when Emily blurts out that she slept with a co-worker, played by Kevin Bacon. Throw Marisa Tomei in the mix as a new love interest for Cal, Ryan Gosling as Cal’s new lady-killer confidante and perky Emma Stone as a single gal who’s caught Gosling’s eye and you’ve got quite a cast. Does the cast deliver? I’d say yes, as the script and co-directing by Glenn Ficarra and John Requa elevates the material from ordinary to extraordinary. It’s a different kind of rom-com filled with tender serious moments and fairly good character development. Laughter is present, with bits of emotion peppered by simple common sense that tends to get lost in the shuffle during family break-ups. You may get a bit side tracked by the stupid parts, but they simply add to the layers of the film. Carell carries the movie well from start to finish, but don’t expect a “40 Year Old Virgin” type comedy; this one has lots of heart with the added bonus of a surprisingly fantastic comedic performance by Gosling. We’ve mainly seen him in dramatic films, such as (“Lars and the Real Girl” 2009), and most recently the heart wrenching film, (“Blue Valentine” 2010). All of the characters are intertwined by the “Six Degrees of Separation” game, or in this case, “Six Degrees of Kevin Bacon.” I won’t reveal how each relates to the other, but the three male leads do end up in a fistfight half way through the movie. That’s one of the stupid parts with some of the crazy. After Emily’s bombshell announcement that she’d slept with a co-worker, causing Cal to jump out of a moving car, one knows this film is going to go in crazy, stupid directions and it continues to until the end. Gosling’s character, Jacob, is a serial pick up artist (PUA); his home away from home is the local swanky bar in town where the girls swarm in by the hundreds, and then he sweet talks his way into most of their beds. Jacob takes pity on the out-of-touch suburban dad who clearly needs help in the ladies department. There are twists and turns to the plot, so I’d advise not reading any spoilers, as the surprises are entertaining and totally unexpected. The only plot line I didn’t like, and feel the film could have been fine without, is the weird teen girl crush on the older dad of whom she babysits. Bottom-line: Entertaining rom-com, with plenty of twists and turns executed by a talented cast.